As with so many of Adobe's more recent programs, the word that best sums up the Captivate 2 interface is 'stylish'. Suiting itself to both basic presentations and more interactive projects, the main viewing window for the design stage has three separate tabs: for Storyboard, Edit and Branching. This makes it easy to switch between getting a overview of your project, editing individual slides, and sorting out interactivity elements. The last of these is particularly useful, because interactivity often tends to get quite tricky alarmingly early on in the design process. 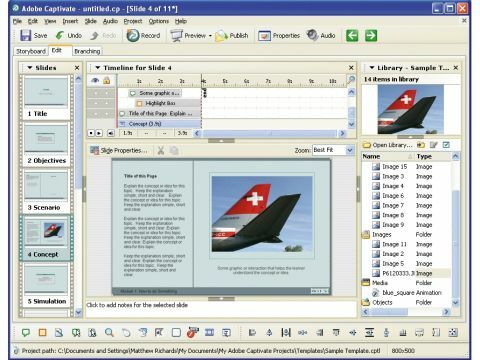 Seamless integration with the Macromedia Flash platform, both at the input and output stage, make Captivate projects ideally suited to online distribution, and across networks or via disc. It's also easy to pick up and run with, even for beginners, with its main strengths lying in presentation design rather than massively complex multimedia projects.